Nintendo of Europe: Thank you very much for joining us today. Let’s start with the big question: Callie or Marie? Hisashi Nogami: (laughs) It’s like having two daughters and being asked which you prefer! I will say though, in the final Splatfest, I voted for Callie. 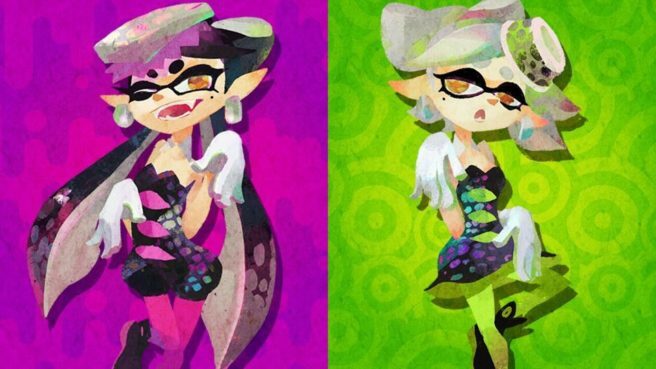 Katsuya Eguchi: I used to like Callie, but now I prefer Marie. NoE: What’s your weapon of choice in Splatoon? KE: Rollers! I just use the Rollers all day long. All of the Rollers. HN: It really depends on the situation, but when I use the Splat Charger, I play more offensively. NoE: Do you still eat squid? HN: Yes, I love it! (laughs) I eat it almost every week. NoE: And who exactly is behind the Squid Research Lab? HN: It’s a secret! There’s a covert research centre situated nearby the research building at Nintendo’s headquarters in Kyoto, and the staff there carry out extensive research on the Inklings and their weapons. It’s comprised of several personnel. NoE: And of course you guys have very high clearance for the research? HN: (laughs) No, no, what we’re doing doesn’t necessarily require high clearance! NoE: Now, on to the Splatfests! We’d like to know which side of these very important debates you’re on. Firstly – rock music or pop music? HN: If I had to pick, I’d choose rock. KE: See, I like cats, but I have a dog! (laughs) Our families like opposites. NoE: Pineapple on pizza. Delicious or disgusting? HN: I’m okay with that. KE: That’s unbelievable for me. HN: I like it! I even put pineapple on top of my hamburgers! In Japan, we have a Chinese recipe where you have fried pork with pieces of pineapple inside, and I like that too. HN: If I had to pick, it’d be singing. To put it simply, I can’t really dance. KE: I basically don’t do either. HN: When I’m driving, I sing sometimes. NoE: So you haven’t tried any of the Squid Sisters songs on Wii Karaoke U by JOYSOUND, then? HN: I don’t know the lyrics, unfortunately! (laughs) I just hum it while I’m driving – I don’t know it by heart. NoE: Early bird or night owl? NoE: Well, that was certainly enlightening! Thank you very much for joining us here today. We look forward to talking to you again very soon.